Children should not just read about history, they should live it. 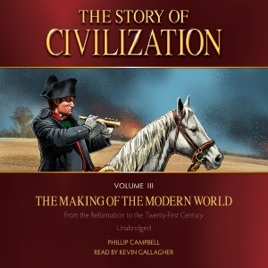 In The Story of Civilization, author Phillip Campbell's historical expertise and story-telling ability make history come alive like never before. The Story of Civilization emphasizes presenting world history as a thrilling and compelling narrative. Within each chapter, children will encounter short stories that place them directly in the shoes of historical figures, both famous and ordinary, as they live through legendary battles and invasions, philosophical debates, the discovery of new inventions and sciences, and the exploration of the world. Volume III: The Making of the Modern World continues the journey where Volume II left off amidst the Renaissance, quickly diving into the history-altering events of the Reformation. This fracturing of the Church dramatically altered the course of modern Europe and the world at large. This volume brings us through present-day Europe, showing us the effects of two world wars and how the Church responded to these changing times. Have you always wanted your children to learn about world history from a Catholic perspective? Here, you’ll have the trusted resource you’ve always wanted. Children will meet great figures like Sts. Pius V, Thomas More, John Vianney, and Margaret Mary Alacoque, as well as powerful leaders like Napoleon and Kings Henry VIII of England and Louis XIV of France. Columbus called Native Americans “Indians” because he thought he had landed in India? Henry VIII was once known as “Defender of the Faith”? Five popes were known as the “prisoners of the Vatican” because they never left the Vatican grounds for 60 years? King Louis XIV was known as the “Sun King” because of the bright brilliance of his palace at Versailles? The Soviet Union built what was called “the Iron Curtain” behind which they ruled half of Europe?